These Italian-style mini cakes have long been a staple of the synagogue Kiddush. Rainbow cookies are the most beloved sweet treat of my childhood, and I know many East Coasters like myself have some strong views of them. Some people call them the “Kiddush cookies,” while I remember them from platters of cookies my mother would put out for piano recitals and holidays: They are always the first to disappear. They aren’t quite Jewish; in fact they are more accurately Italian. But as with many foods born in New York City when Irish, Italian and Jewish immigrants were all living side by side, they have been adopted by Italian bakeries and Jewish delis alike — and they are beloved by (most) all. 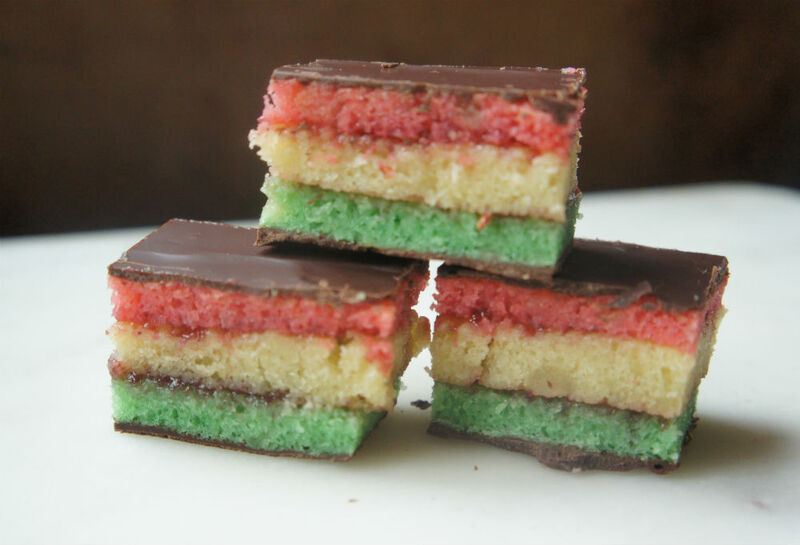 What you may not realize about rainbow cookies is that they aren’t really cookies at all, but more accurately, thinly baked layered cake made with flour, sugar, butter, eggs and almond paste, giving its distinct flavor. They are filled with raspberry jam, chilled and covered on top and bottom with a layer of melted chocolate. Slice them off into bite-sized rectangles, and you have the most perfect non-cookie cookie treat. You could dye the cookies any color combo you like, for example these ombre blue version for Hanukkah, but red, white and green are traditional in the New York area. I suggest buying three square 8×8 or 9×9 baking pans to make this task easier. If you don’t have a food scale, I would highly recommend investing in one. 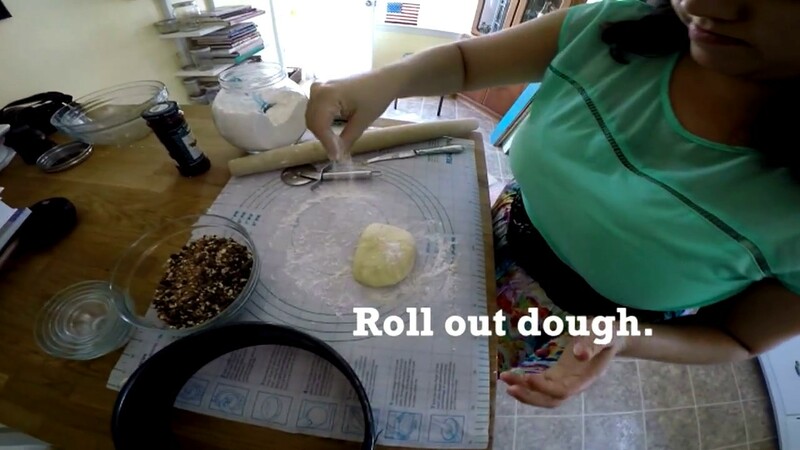 It will make tasks like measuring batter or dough much easier and far more accurate. If you’ve never worked with almond paste before, make sure it is fresh and that it is broken down into small pieces. You can even pulse it in a food processor or by using the paddle attachment of a stand mixer before adding to the batter. But if not and you end up with clumps, fret not: It will still bake fine (and taste amazing). Go ahead — try your hand at my absolute favorite cookies. Full recipe and instructions below. Preheat oven to 350 degrees. Grease your pans. Add parchment paper to bottom of each pan. Grease again and add light dusting of flour. Tap pan to remove any excess flour. Using a hand mixer (or whisk attachment to stand mixer), mix eggs and sugar until thick and yellow. Add crumbled almond paste and combine. Add melted butter, flour, salt and vanilla. Divide batter into three even amounts. (Try using a food scale if eyeballing is too difficult). Leave one plain. Add green food coloring to one batch of batter. Add red food coloring to the other batch of batter. Pour batter into prepared pans. Bake for 8-9 minutes, or until just set and no longer wet in the middle. Place chocolate, shortening and pinch of salt in a glass bowl. Microwave for 30 second intervals until melted. Stir vigorously to ensure there are no clumps. Place a piece of parchment paper on top of a platter or baking sheet. Add red cake layer to parchment paper. Spread thin layer of raspberry jam. Top with white layer. Add another thin layer of raspberry jam. Top with green cake. Carefully spread half the melted chocolate on top. Place in refrigerator for 15-20 minutes or until completely hard. Turn over and spread remaining chocolate on other side. Place back in refrigerator for 30 minutes or overnight. Trim edges and slice into cookies. Cheesecake is the iconic Shavuot dessert, as sacrosanct as a Hanukkah latke or Passover matzah ball. This frozen ode to everyone's favorite deli treat has actual chunks of black and white cookies throughout. A beloved cake made famous by a "Seinfeld" episode.